Are You Ready For The Orange Strawberry Festival? Around Town, Charity Events, Home, Latest News Comments Off on Are You Ready For The Orange Strawberry Festival? Years ago, the little Orange Congregational Church Strawberry Festival moved from the Town Green to the Orange Fairgrounds and that is where it will be again this year on Saturday, June 10 from 9 a.m. to 5 p.m.
Come join the expanded Arts and Craft Fair and Home Show at the 9th Annual Strawberry Festival featuring live music, hayrides, children’s events, a Red Car Show and fabulous food, including sausage and peppers, burgers, hot dogs, pulled pork, strawberry shortcake, sundaes, and chocolate-dipped berries. If you are a vendor and would like to display your wares, sign up to get a table now. The rain date is Sunday, June 11, same place and time. The Orange Congregational Church hosted its annual Strawberry Festival on the Orange Fairgrounds Saturday, June 13 from 9 a.m. to 5 p.m. The lines for the Strawberry Shortcake and such were long and steady all day long. 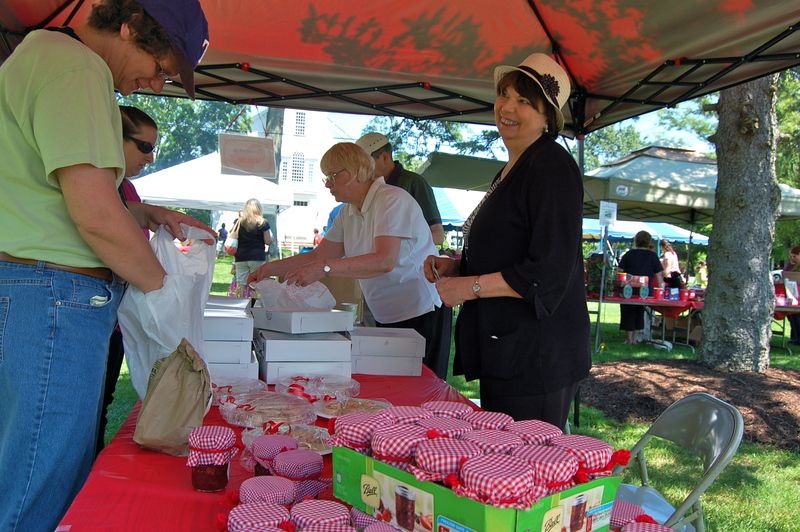 The fresh baked Strawberry Rhubarb pies (still warm) were flying off the table, and vendors sold their wares in under tents on the field. Shamrock Farm brought truckloads of potted and hanging plants for sale which made for a colorful backdrop at the event. Check out crafters and fine arts, enter to win great raffle prizes, entertain the kids with rides, games, face painting and hayrides, and of course, enjoy luscious strawberry shortcake and other summer specialties. Back again this year: a Red Car Show! Call 203-795-9749 or visit http://www.orangecongregationalchurch.org/ for more information.